By comparison with the Korean term, haengma, the Japanese understanding of shape seems perhaps more static than dynamic. However, the static nature of shape may be an amateur misconception. Below are examples illustrating the dynamic nature of shape. 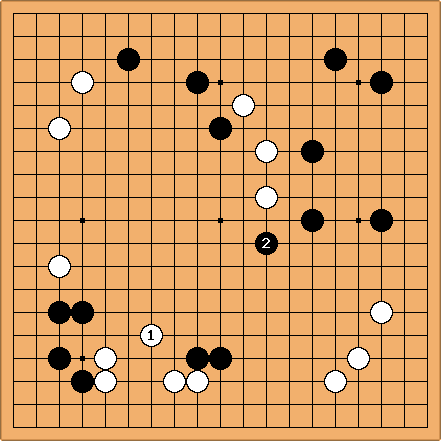 In Go Seigen: 21st Century Go (Go Seigen Nijuuisseiki no Go), vol. 9, pp. 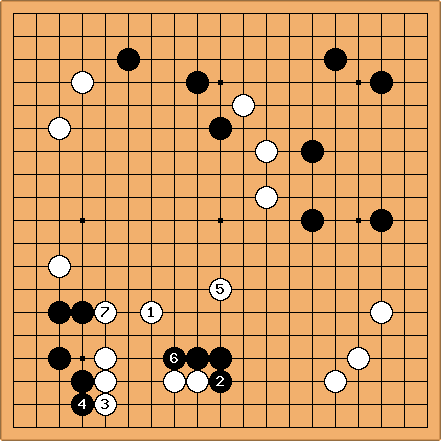 210 - 211, Go Seigen criticizes for not being shape. is the shape move. If , then is just right. 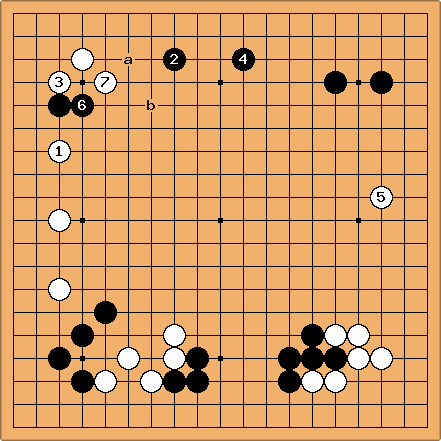 If , White can play kikashi with and then make a covering play at . Bill: To me, and in this diagram reveal the dynamic nature of . Shape is not just about eyes and connections, but about efficient and harmonious development in relation to the rest of the board. In Cool and Collected Chitoku (Taizen Chitoku), p. 49, Yoda suggests the above variation. He says that, since is a kikashi stone, it is easy to throw away, and stepping back with is shape. B a would provoke W b. Again, shape is not just about eyes and connections, but about harmonious development. DJ: I didn't find a page named Good Shape, and I am not so sure whether the quotation below pertains to this page, but other pages didn't look that suitable to me... anyway, here we go. I am reading again Appreciating Famous Games, by Ohira Shuzo 9 dan - n. 28 in the Go Super Books series. 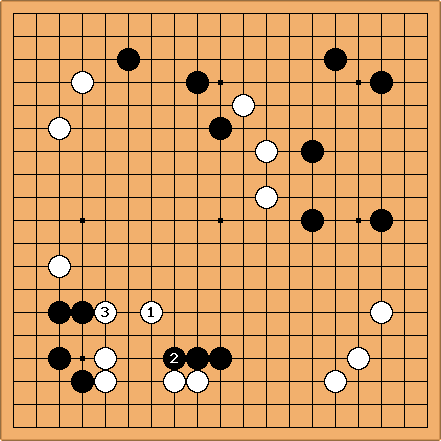 at a would have been good shape (which is a phrase we use to denote that stones are arranged in such a way that all the vital points are guarded) but Black could then have hemmed him in with b. This would be intolerable. Well, what about that??!? Good shape is when stones are arranged in such a way that all the vital points are guarded. Kirk: I thought that was the definition for Thickness. Oh, I see (looking at that link), thickness requires that it have influence as well as be strong. So since it would be sealed in (no influence), it's not really thick, it's "merely" good shape. Bob McGuigan: I think in the preceding diagram is in accord with Bill's comment about shape being harmonious development, too.